Strawberries Romanoff – This quick and easy dessert, made with just 3 ingredients is perfect for any night of the week! My Mom made this all the time when we were kids and we just loved it. Some people add orange zest or a splash of Grand Marnier but I think it’s perfect without. It’s easy to whip up and makes a great after dinner dessert. This is also great if your looking for Valentine’s Day ideas. A few other Valentine’s Day recipes I love making for the occasion are Homemade Chocolate Cake, Mixed Berry Pie, Vanilla Bean Panna Cotta and Chocolate Crepes with Strawberries. You can also check out this full list of Valentine’s Day recipes. Combine sour cream and brown sugar and mix well. 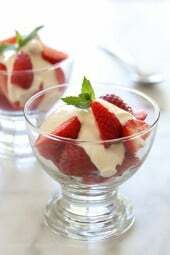 Place about five strawberries in each glass and drizzle each with 2 tablespoons of cream sauce. The cream can be made ahead and be refrigerated for up to 3 days. I used plain yogurt tonight, and it was delish! 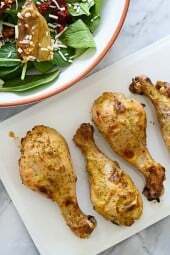 couls you use Greek yoghurt instead of sour cream? Can you sub greek yogurt for the sour cream? Will that make a huge flavor difference? I have a picky eater husband who hates sour cream but this looks delish! Delicious!! Thank you for your recipes. Everything I have made is outstanding!! I am on WW and your recipes are much better!! I love this! My mom used to serve strawberries from our California garden with a bowl of sour cream and a bowl of brown sugar for dipping – yum! So many memories! I make a similar version with chobani plain yogart and a dash of vanilla. Low fat, low cal yumminess. Huge hit with everyone who tried it. Some people were hesitant, but that may have been because I mixed it in a bowl then stored it in the original sour cream container. ha ha ha. Your recipe looks wonderful and I hate to mess with anyone's recipe but can I substitute sour cream for Greek non-fat yoghurt and the sugar for maple syrup? Or would that spoil it, I don't want to do that please advise. I was craving something sweet after feasting on your skinny eggplant parmesan (wow, incredibly delicious!) and this effortless dessert completely satisfied without blowing my points. I had no idea that a few simple ingredients made such a tasty combination. I had mexican style sour cream and it was terrific. 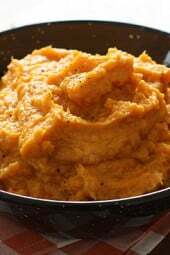 Thank you, Gina, your website is full of amazing recipes that I, as a self-proclaimed foodie giving WW a go, completely rely upon and have thoroughly enjoyed. This was a hit at my house. Easy and delicious. Thanks Gina! Would this work just as well with Greek yogurt?? Yes! Sour cream and greek yogurt taste so similar that I often substitute it…plus you get the probiotics! Can use coconut sugar in place of Brown sugar too! You can't beat only 3 ingredients! Delish! I can't believe how easy this is to make. We added blueberries and my family literally licked the dishes. I made this as a gluten free dessert for my mother in law's birthday. I quartered the berries into a pie plate, then poured the cream over the top right before serving, so everyone could take a scoop. Yum! It usually has a brown tint from the sugar, not sure why the photo didn't capture that but you did it right! This is super Yummy…but mine came out very brown in color..in your pic it looks white did I do something wrong? Thanks Shonta, I really love this too, and it couldn't be easier to make! Phenomenol as are all of your recipes i have tried so far…made it tonight for myself and the wife…was skeptical of the combo at first but yum! !and who can argue with 2 points lol! !I wasnt sure how the wife was going to like it as she has this amazing palate to be able to taste every season spice flavor etc in a food (she should have been some sort of food critic I swear) and she loved it! !We have tried the arroz con pollo, cuban black beans, asian glazed drumsticks, the chipotle rice, shrimp quesadillas with tomato avocado salsa and are just in love with the recipes so far as I just discovered the website about a week and a half ago…love the tomato avocado salsa with baked chips…ive had to make it 3 times this week for a snack at the wifes request. I am doing weight watchers and have been sharing your site and recipes with fellow weight watchers and just people in general…i almost feel like im not dieting using your recipes so thank you!! Also delicious with a sprinkling of cinnamon on top! I truly love this dessert and love that it's so easy to make with ingredients I always have on hand! 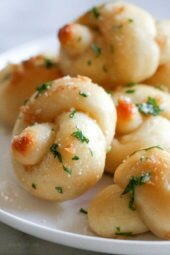 I happened upon your site today and found this recipe. It was exactly what I needed! I am doing WW and have been struggling to find something to fill that sweet creamy craving. I have had strawberries Ramonoff of La Madeline bakery and loved it. As soon as I saw this recipe I popped into the kitchen and made it (so happy that I had all of the ingredients). Delicious! My 8 yr old daughter also took some to school for snack time. THANK YOU! Just stumbled across your website the other day….and this recipe intrigued me. So much, in fact, that I have made it 3 times! Love it! @Anne- looks so much prettier eating them out of champagne glasses, doesn't it! I made this with my six year old daughter this weekend. We ate it twice (Friday and Sunday) and enjoyed it so much. We even ate it out of champagne glasses as you showed. So fun and delicious! Yes! Me too! But there are a lot of variations, most using orange liquor and cream. Love it simply with sour cream and brown sugar. Morning Gina!! My mother used to make this for us as a child, I never knew it had an actual name. I'd been eating this last week…logged on here last night & saw it and called my sister laughing telling her it has a name! Thank you for the idea!!! Going to a get together tonight where the theme is "things that go together" (ex: PB & J, mac n cheese). I have been stumped all morning what to bring !! This will be a great version of strawberries and cream!!!! Oh yum, that was good! Everyone loved it and I made it with fat free sour cream, just out of habit. That's a keeper! I haven't tried it with fat free sour cream, glad it was good! Even lighter!! I LOVE this recipe! Thank You! I have made it 2xs already this week! I've never used Splenda for this, but I'm sure it would taste good if you like Splenda. @Pam, nice idea, I'll try that and see if it changes the taste. another great variation on the theme… fat free cream cheese and brown sugar with apples. I made this using blackberries instead of strawberries and agave nectar (has a lower glycemic index than sugar) instead of brown sugar and it was delicious. has anyone tried this with Splenda's blend of brown sugar? We made this last night using fat free sour cream, and it was amazing. The husband and the baby LOVED it, and so did I. We'll be making it again tonight for sure. @karen, aren't you glad you tried it! @Katie- lol, I got excited when I plugged in the numbers myself! Just made this for my husband and I and he must've asked me three times, "are you sure this is only one point??" It was THAT good! Thanks!! I just want to let you know how much I love your site — the recipes and the amazing photos. It is so inspiring in so many ways! I was skeptical of the combination…but I just had to go out to the kitchen and try it…sooooo good!!!! Yum, nice twist and picture going to give this one a go! Isn't it!! What's great about this recipe is chances are you have all these ingredients in your home already!! Thank you so much for sharing this! I tried it last night and both my husband and I were licking our bowls clean. The sour-sweet combo is out of this world. My mother used to make it with green grapes, sour cream and brown sugar. thank you for reminding me of that one and inspiring me to try this one! That looks so delicious. Gotta make it! We made this tonight and it was absolutely delicious! Thank you. Yum. Can't wait to try this! It is so pretty. I wish my mom had made this for me when I was a kid. There are so few ingredients but they come out looking and sounding delicious. @Kaylyn, thank you, yes we must be! My mom prepared strawberries, sour cream and brown sugar for us the "morning" after prom (it was like 3 am). I'll always remember that! You can also dip strawberries in sour cream and then roll them in brown sugar, although harder to control portions this way! This was a special treat at summer camp when I worked there as a counselor. Love this dessert! We're channeling each other because I just made it for a dinner party last night. Great photo of the finished dish. Mmm. We do this all spring in my husband's family. Love it served that way – very classy.